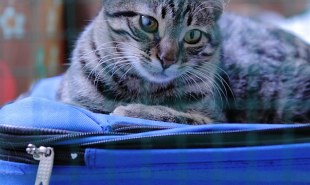 For travelers, misplaced or damaged luggage can be a huge inconvenience, but if that luggage happens to be the living, breathing family pet, then mishandling by airlines can have rather more tragic consequences. Delta Air Lines saw 51 pet-related deaths on its flights over the past five years, the highest of any airline, and in an effort to get that number down to zero, they are introducing a pet tracking service so that owners can rest assured that their pet is being taken care of while onboard Delta’s aircraft. Passengers paying the standard USD 50 fee to check in their pet will have the pet tracking GPS included when flying from 10 major US cities. The tracker, designed by Sendum Wireless Corp, keeps users updated about the location, position and angle of the pet’s transport crate. Sensors will also monitor the temperature of the animal and their surroundings: if it gets dangerously high or low an alarm is automatically sent to Delta, so that a crew member can respond immediately. In an era when most airlines cutting back on perks, customer services like this can help companies stand out from their competitors. Are there other services which could help ensure passengers’ luggage is being properly taken care of?